I’ve been meaning to read this book ever since I came across Evie Wyld’s excellent short story ‘Menzies Meat’ in the summer. 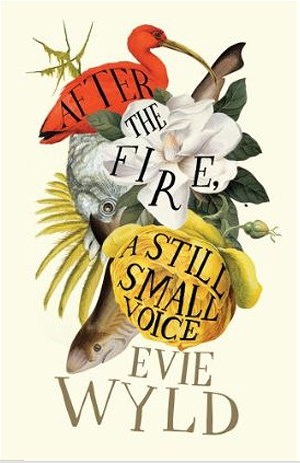 In the intervening months, After the Fire, a Still Small Voice has won the John Llewellyn Rhys Prize, and received near-unanimous praise – now here’s some more. What’s particularly striking about the novel, looking back on it as a whole, is how quiet it is; it’s probably the quietest book I’ve read all year. Its tone is quiet, its theme is quietness – the things that aren’t said, and the possible consequences of not saying them. Wyld’s debut is a character study revolving around two men: one is Frank, who leaves his life in present-day Canberra to live in a remote shack his grandparents owned, and hopes that the past will stay where he left it. The second man is Leon, whom we follow from childhood: his father leaves home to fight in the Korean War, but struggles with life when he returns, so much so that he ends up fleeing. Leon’s mother goes in search of her husband, leaving the young man to cope on his own – and then Leon receives a letter of conscription for Vietnam. Leon, by the way, is Frank’s father. Typing that last sentence almost feels like a spoiler, though there’s no real reason why it should. It’s not that Wyld is keeping the relationship secret to provide a surprise twist; rather, it’s that the story she tells never demands the connection be stated. The two narratives are kept separate, and there’s a gap between the young Leon and the father we glimpse in Frank’s tale (we can speculate on what drives Leon to become the man he is in the present, but we don’t have the full story). In effect, the central father-son relationship of the novel is hardly in the novel at all – the theme of silence between men (and between generations of men) is reflected at the broadest structural level. That same theme is also there at the level of plot, as both protagonists have to deal with the consequences of things left unspoken. Frank doesn’t reveal much about himself to the people of his new town, which comes back to bite him before novel’s end; and Leon finds it hard to talk to his father when the latter returns from service – even after so long apart, silence around the dinner table seems more appropriate than facile questions that could never reveal the truth of what Leon’s father witnessed. At school things caught at his hair and plucked at the back of his trousers. His pen moved slowly across the page, ink swelled into the paper. He felt himself trapped between the bone and flesh of his face, and he couldn’t move. Everyone else’s hands moved at impossible speed over their work, the noises of the classroom were high-pitched and speeded up, made no sense. He felt his own body, a sluggish weight, pale and thick, a rock with a wooden shell. With effort he stood up…he walked out of the classroom, away from the school, heavy enough that he might sink into the ground and suffocate, or else fall on the pavement and shatter into splinters. After the Fire is full of such vivid imagery (of place as well as of feeling) that jumps out; but there are also highly significant points which come across as relatively subdued. For example, when we first learn that Frank beat his wife, it’s dropped in casually; one might even have to go back and re-read, just to check that’s what has been revealed. Character hints are dropped in subtly, suggesting that these are things the protagonist don’t know about themselves. Frank doesn’t know why he gets so aggressive, for example; nor does Leon understand what makes him want to photograph a boy he kills in Vietnam – and we don’t comprehend the minds of these characters, either. Though we see the novel through their eyes, there is still much they don’t (or can’t) tell us. I don’t know whether I’d go so far as to call Frank and Leon antiheroes; but they’re not entirely sympathetic protagonists, either. What we have here, I think, is a portrait of two flawed men trying to cope with life’s challenges the best they can – which isn’t necessarily the best way there could be. After the Fire, a Still Small Voice tells a very real story; and, quiet though it may be, it’s a novel that resounds loudly.